Watching a bug scamper past his last meal, a soldier laments, “Tomorrow I’ll be gone and that cockroach will have more contact with my wife and kids than I will.” Another soldier reaches over and squishes it saying, “Now you have the upper hand.” This scene neatly encapsulates the absurdity and dark humor that is Stanley Kubrick’s Paths of Glory. Kubrick entered new territory with Paths. He’d dealt with war before in his little seen first feature Fear and Desire and he’d already started exploring man’s dark alleys in the films noir Killer’s Kiss and The Killing. But here, he had a new challenge – working with a major star. I’ve seen Paths many times, but watching it the other day was like seeing it anew, as is always the case with Kubrick’s films. They seem to morph to match each new age. The story centers on a mad general who orders Douglas’s Col. Dax to lead soldiers in a suicidal attack on a German position known as the “Ant Hill.” (That’s short, of course, for “worthless objective.”) When the men fail to make it beyond the wire – their wire, not the enemy’s – the mad general ponders the scar bisecting his cheek and then orders three men to be made an example. They are to be court-martialed and executed for cowardice. Col. Dax is appointed their council and the trial offers Douglas what would ordinarily be his star moments to shine. But he is clearly out-classed. Who are three soldiers or even a righteous colonel next to a general? And who are any of them next to the powerful and faceless people who waltz around the edges of Paths? Douglas sputters his defense while the mad general sits idly rolling his eyes and checking the time. Paths struck me as a great first chapter in the richest vein in Kubrick’s oeuvre. During Barry Lyndon and Eyes Wide Shut, the words “all the best people” can be heard, referring to the type of people who can get away with murder. The social elite of Paths are their prototype. Barry Lyndon asks: “What is a common Irish man next to the rich and powerful?” Eyes Wide Shut repeats the class hierarchy of Paths only with hookers in place of soldiers, Doctor Bill in place of Col. Dax, the rich Mr. Ziegler in place of the general, and the masked party-goers in place of faceless, waltzing party guests. I remember asking, “Why are so many scenes in Paths set in rooms adorned like the 18th century?” (I would later ask the same question about the ending of 2001: A Space Odyssey.) And why does Paths take a time-out to show us rich people waltzing at a party? Then Barry Lyndon showed us the 18th century as a lair for “all the best people” and Eyes Wide Shut opened with all those best people dancing the waltz at a decadent party and my questions were answered. 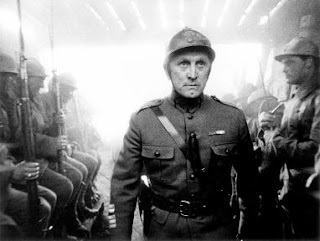 Paths of Glory plays like Kubrick’s entire oeuvre rolled into one film. Maybe Douglas slipped one in on Kubrick though. Paths has an emotionally powerful ending unlike anything else Kubrick ever touched. You won’t soon forget it.